When I bought my car, one of the first things I did was buy a fancy new Alpine head unit to replace the factory stereo. This gave me the ability to add an XM tuner and an iPod adapter. I ran the iPod cable into the glove compartment, so I could just connect the iPod in there and close the glove box when I hopped in the car. This was pretty sweet. Between XM (BPM and The System mostly, since you asked) and my iPod, I never had to suffer through a commercial in the car again. Then I, upon receiving instructions from Steve, went out and bought an iPhone. That's now the iPod that I use most of the time. Strictly speaking, though, the glove compartment isn't the most useful place for one's phone (though it could be in the top 10). And, to boot, when I attached the iPod cable from the stereo to the iPhone, the screen cleared and just said “accessory attached”. Not terribly useful. So, I decided I'd add an aux input to the radio, and hook it up to the iPhone's headphone jack. That part was easy; since I had an Alpine head unit, all I had to do was buy a $20 cable and attach it to the existing “AI-Net” bus. This gave me a pair of RCA-style connectors behind my radio. Well, that project was far too straightforward and had little to no chance of inflicting significant damage rendering my vehicle undriveable, grotesque, or en fuego. I decided what I really needed was a jack on my dashboard so I could plug the iPhone in there, and wouldn't have an ugly cable crawling out from some dusty crevice in my dash. That would give the project the professional look that I want deserve pine for. Mount the jack in a convenient location in the dash area of the car. Cut the extension cable and solder the female end to the connectors on the back of the jack. 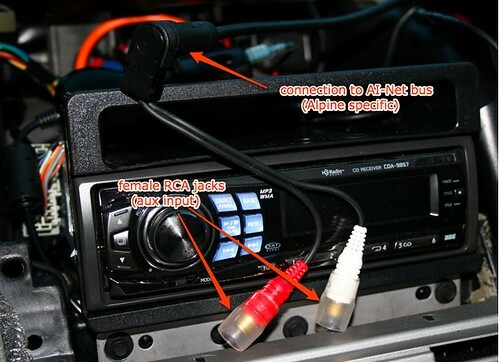 Use the 1/8″ to dual RCA cable as-is, connected to the RCA female inputs on the head unit. Then, connect the male 1/8″ plug from that cable to the female 1/8″ connector attached to the jack, and we'll be done! When we're all finished, we'll be able to pump our awesome tunes through our car stereo, and look like smooth and sophisticated as we do it. 'Cause that's just the way we roll. Note: I'll show you pictures of how things looked around my radio, but you'll be on your own to find a good, convenient spot to mount the jack. I highly recommend using a Crutchfield Mastersheet for your vehicle if you're not familiar with accessing the area behind your radio. I don't know that you can buy the Mastersheet by itself, so you might have to buy something else to get it. It won't be hard to find something you want. Another note: Be careful. There are wires behind your dash, and some of them carry scary, impish little beasties called electrons that would love nothing better than to zap you and ruin your day. Don't give them the satisfaction. First, I opened the dash according to the Mastersheet instructions to expose the aux input jack that I had attached to my head unit. Next, I went to my workbench to build the jack that I would install later. Out of the box, the jack has three connections on the back–one each for left, right, and ground. On the back of the box, there's a helpful diagram that shows how the connections match up to the conductors on the inside. This diagram is not terribly helpful. Based on that diagram and some independent research, I've labeled the jack a little more clearly so you can see the purpose of each of the conductors in our project. Take your extension cable, and cut it a few inches behind the female connector. Inside it, there should be three wires, which will eventually match up with the three solder points on the jack. Usually there will be a red wire for the right audio channel, a black wire for the left audio channel, and a bare wire for the ground. You'll need to strip the outer covering of the wire for some length (maybe about an inch and a half) to expose the inner wires, then strip off about a half-inch from the shielding on the inner wires. So, ok, it's time to solder. This involves a power tool, so you should feel good about yourself as you do it. In my opinion, these are better because you're not tethered to an electrical outlet, and they heat up faster than the cheap electrical soldering irons that I've used before. You can buy the butane fuel in the tools area of a hardware store for a few bucks. Plus, it's powered by FIRE! And fire is cool. After the solder cools, you should wrap a bit of electrical tape around the left and right conductors to make sure you don't get a short. If you had more foresight than me, or if you're reading this before actually doing it (ha! ), you could also thread some heat shrink onto the wire before you solder, and then just move it into place and heat it up. But I didn't think of that at the time, so bah. At this point, you have done all of the electrical work. This would be a good time to test it out. If you have headphones and a 1/8″ stereo patch cable, you can attach one to each end of the device you've assembled (one to the end of the cord, and one to the jack), and then the extra male connector to some audio device, like your iPod, or a can of tuna. If you hear music through the headphones, that's a Good ThingTM. If not, then check your soldering to see if you have a loose connection. Even if works just fine, bend the wire gently (not hard!) to see if it affects the sound. If it does, then you should check your connections and resolder. If not, then you totally rock. The next part is going to be highly specific to the vehicle you're installing the jack in, so I can't do much more than provide a case study of what I found. You need to find a spot in your dashboard, preferably on a piece that you can temporarily remove, that is thin enough and has enough room behind it to accommodate the back of the jack. In my case, there was a spot right next to the radio that suited my needs just fine. The area surrounding my head unit is actually removable, so it was easy to take it over to my workbench. I originally was going to use a spot lower on the console near the gear shift, but ultimately decided against it since it was not removable, and thus much harder to access. 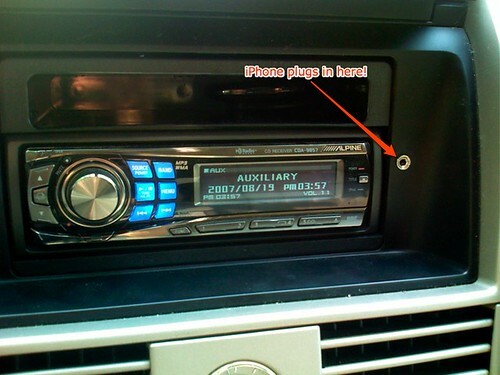 A couple other things to consider in selecting a spot: Give some consideration to how you'll run the wire from the aux input on the back of the radio to the installed jack. You'll make your life easier if you minimize the amount of cable fishing you have to do. Also, remember that you'll be plugging a wire into the front of this jack and running it to your portable device. I chose to put the jack on the right hand side of the radio instead of the left so the wire wouldn't obscure my view of the radio's display. Next comes the big scary part: drilling the hole. I started by removing the metal mounting collar from the jack (very important! ), and choosing a bit that was obviously slightly smaller than the part that pushes through the hole. After taking a few nips of brandy, I drilled that small hole all the way through. I then repeatedly increased the size of the bit in 1/64″ increments and redrilled, until the jack would push through. I'm not going to lie to you, this was nerve-racking. It was difficult to get past the “ZOMG I'M DRILLING A HOLE IN MY CAR ZOMG” feeling, but I did it, and that means you can, too. In my particular case, when the hole was large enough for the jack to fit through, I found that the plastic was slightly too thick so the threads on the front weren't quite exposed enough. The mounting ring couldn't grip them! To save the day, I broke out a Dremel with a grinder attachment and slightly deepened the hole on the back of the panel so the jack would poke though a little farther in the front, allowing the mounting ring to grip the threads. I also had to grind a little bit of the trim so the square backing of the jack would fit properly, but I was careful to only grind the inside edge so it wouldn't show once it was installed. Grinding down parts of your car. Not scary at all. Once I was done grinding, though, it fit just fine, and as you can see, the jack fit nice and flush against the back. I just had to connect the wires and reinstall the panel in the vehicle to be all done. If you're following along at home, it's a good idea to test your setup at this point before your car is all put back together, so you don't have to take everything BACK apart if you have problems. If you connect your audio source to the jack with a patch cable and turn on your radio, it should work! If it doesn't, check your connections and go backwards, a step at a time, until you find the problem. In my case, things worked just fine, so I put my car back together and admired my expert craftsmanship. And you're done! Now, when you've ripped your favorite music to your iPhone and you're jonesing bad in the car, you have a solution that doesn't compromise your style. And, it's pretty awesome to be able to put that patch cable away when you don't need it. If you decide to do this project yourself, let me know how it goes in the comments! PS: If you decide to buy something from Crutchfield as a result of this post, and you're a new customer, hook a brotha' up and give them referral code “p51zi-fiv3b-gx3yu”; you and I will each get a $20 credit. That's cool. I've got a reasonably interesting setup of MisterHouse (a nifty Perl-based home automation program) running on a Linux machine upstairs, that does stuff like turn on lights automatically when it's getting dark or when I enter a room, turn lights off when there hasn't been any activity in a room after a predefined time, and so forth. Maybe I'll post more on that later. One suggestion that I've seen is to install a battery powered motion sensor (like this one somewhere inconspicuous in your car. This broadcasts on the X10 wireless spectrum, and would likely be within range if your car is at home. It broadcasts “motion” and “still” (i.e. “no motion”) signals, as well as “light” and “dark”, so it will send signals even if it doesn't see movement. Then, presumably, you can configure MisterHouse so that, if it notices these wireless signals, it assumes that you are home. Another way you could do it (that would be fantastically cool) would be with RFID. If, somehow, you carried an RFID tag around with you most of the time, a long-range RFID reader could tell when you're home and alert MisterHouse appropriately. This would be sweet. One idea (and I don't know if this is my own, or one that I read somewhere) is to put the RFID tag on your keychain, and then embed a reader in a hook where you hang your keys when you come in the door. That would work great, as long as you are diligent about putting your keys there as soon as you walk in the door. Me, that's not how I operate. As soon as I walk in the door, I like to baseball-pitch my keys into a neighboring town and/or state for convenience when I'm about to leave again. Oh, and also, I don't have any RFID stuff yet, so I'd have to buy some and learn it and integrate it. Devil you know and all that. So, after getting my (awesome) iPhone and pairing it with my wireless network, I realized there was another possibility–if the phone is currently on the network, that's a pretty good indication that I'm home. My phone is always on, and always with me, so it seems there's a fairly low likelihood of false positives and false negatives. My basic plan is to try to ping the phone on some frequent basis, maybe once per minute, and see if it responds. If it does, then tell Misterhouse that I'm home. One caveat: I use DHCP on my home network, so it's theoretically possible that I could have different IP addresses each time I join the network. Since I hacked my Linksys WRT54G to use DD-WRT, I could configure the router to give my phone a static DHCP assignment. That's too easy, though, so I decided I'd try to learn a bit and ping the phone by its MAC address (which is hardware-specific and never changes) instead of its IP address. Your system maintains a mapping from MAC address to IP address internally. This mapping is done via a protocol called ARP. 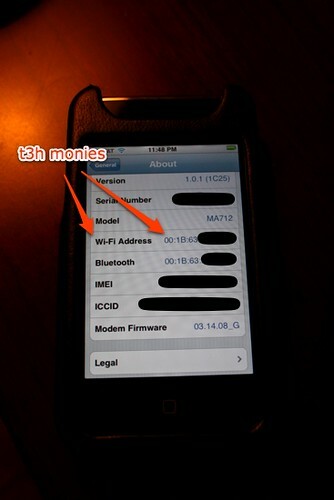 From this, I know that my iPhone's MAC address starts with 00:1B:63. PING 192.168.1.255 (192.168.1.255) 56(84) bytes of data. The phone wasn't pingable anymore! I did some digging around, and came to the conclusion that the iPhone disconnects from the wireless network when you're not actively using it. This is probably done to conserve power. Unfortunately, though, this kind of defeats the point of the entire attempt, as I need the phone to be pingable on a continuous basis in order for my presence detection scheme to work. So, that's why I put “almost” in the title. Anyone know a more clever way to do this? I recently decided that the reason I don't like any of the laptop bags I've ever tried to use is because they don't have enough pockets. Cables, adpaters, and everything else ends up in a big wad at the bottom of my bag, which drives me up the wall. the same in this regard. radioShark, complete with terror-inducing fin. Soundtrack optional. episodes as you feel the need. Ready to see how it's done? Good. Let's go. where you can buy a new one for $45, or a used one for about $35. newer, more functional versions available on the official radioShark download page. started recording at 8:05pm and recorded for 55 minutes. programs up to recur on the appropriate days. use a high-compression encoding later, and let's not forget that it's already AM radio quality! else: BeSweet v1.5 (beta) using the Nero DLL's. have a license) or try something else. ".wav" suffix to each, then concatenate the prefixes into a single string for "glob()"
the encoded files sort properly. Panel to run this script every day. although not as quickly as the directory on your hard drive was before. So, how do we present them as a podcast? Behold the set of scripts that I authored to do just this task. <enclosure url="<?php echo "$file_url"; ?>"
dump out the XML. Easy. audio files, and magic happens when I call them up on my browser. manual podcast in iTunes, and you're golden. Posted on March 15, 2006 by jdhorne Tagged diyhackpowerxbox	CommentsNo Comments on XBox – Now with remote controlled power! XBox – Now with remote controlled power! The biggest problem, though, is that you still can't use the DVD remote to control the XBox power. You have to get up off the couch (horrors) and push the power button. No fun. Well, Team Xecuter recently released a separate mod, the X3IR, which adds a separate IR receiver to the XBox, which allows you to control power, among other things. I ordered one, and installed it tonight. All of the directions I found, though, assumed that you had an Xecuter 3 Control Panel and an Xecuter mod chip, which I didn't; I have a SmartXX chip, which isn't compatible with the control panel. After much, much digging, I finally found these instructions, which tell how to install with any mod chip. However, there is an error in the diagram on that page showing the solder points for a version 1.6 XBox! I discovered this when I connected it all up and discovered that it wouldn't power on. Comparing it to the other directions, though, I noticed that the solder points for the Red1 and White wires were reversed. So, I took it all apart again, swapped those wires, and it worked just fine. Yay! Now we can be lazy and control the power from the couch. Life gets no better than this. UPDATE: I sent a message to the guy who authored the instructions with the error, and he has graciously fixed them.